It goes a little something like this. Pre-drink drinks, drinks, food, drinks, tequila, dancing, crying, night bus, Thursday morning work. We’ve all been there and experienced it – you manage a morning at your desk without dashing to the bogs to throw up, and all the meetings you attend you find yourself a pariah in the corner because you smell like a day old bath of beer. But there is light at the end of the tunnel – lunchtime – and what better food stuff to cure your hangover than the humble burger. If you can ignore the blaring metal music from Tommi’s stereo, the payoff is worth it. Tommi’s burgers offer pure, stomach settling joy with their soft buns, aged beef and mild American cheese. Saucing and pickles are DIY so you can decide what’s going to help you beat the booze blues. 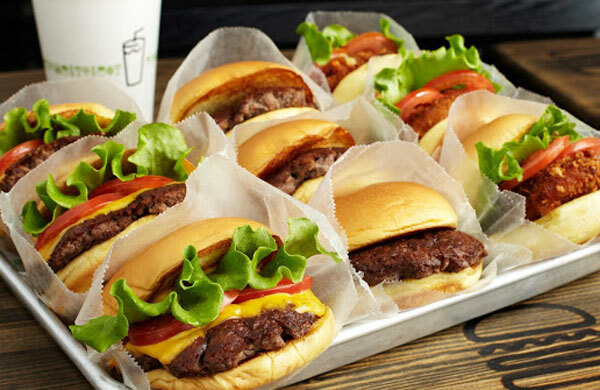 Shake Shack burgers are the ray of sunshine to cut through your hazy reality. The vivid colours of lettuce, tomato and cheese coupled with the smell of caramelized beef will instantly have you forgetting your self-inflicted pain and get your taste buds going. And if you need a hair of the dog, you could do a lot worse than a glass of ShackMeister Ale. The clue’s in the name. If you’ve got a dirty hangover then a dirty burger will sort you out. And none come much filthier than the £5.50 cheeseburger from Dirty Burger. Coated in a curtain of cheese and oozing sauce and juice – carbs and fat – all you need to settle that fluttering stomach. If you can’t hold off until lunchtime, then Patty & Bun in Liverpool Street should be on your list to beat that hangover. An Ari Gold has been known to cure all sorts of ails, but they now also serve breakfast buns filled with mangalitsa bacon, as well as cheesy hash browns. On Thursdays and Fridays, Byron branches around the capital are packed full of the previous night’s revellers looking to get their hit of carbs, fat and sugar to help them get through the remainder of the day. And it’s not just the burgers that will help you through, the onion rings and mac ‘n cheese will all tame the raging hangover. So next time you’re feeling worse for wear and you need a satisfying hit of burger joy – there’s a place not far from you that will make you feel SO much better.